The newest Nickelodeon star is bursting onto DVD with this Walmart exclusive special release of JoJo Siwa: My World. This special DVD release from Nickelodeon Home Entertainment contains JoJo’s first-ever concert special as well as behind-the-scenes content with JoJo herself. JoJo takes fans on a journey through all of the moments of her life that have led her to her very own concert performance at Mall of America. This special release comes just in time for the holidays and comes with a special JoJo Siwa Signature Bow as well as 15 bonus minutes of content exclusive to this DVD! JoJo Siwa: My World is a perfect release for fans of this sweet, sassy and talented young artist. JoJo Siwa: My World is available now, exclusively at Walmart for $9.96. Win: Two lucky winners will receive a copy of JoJo Siwa: My World DVD + Bow Set! The deadline for entries is December 21, 2017 11:59pm HST. If you submitted an eligible entry and it is chosen by random.org as the winner, you will be notified via email on or about December 21, 2017 (make sure your email address is in your profile or comment and be sure to check your junk/spam, etc. folders) and will have 3 days to respond. I'd love to win this for my daughter because she's a big fan! i would love to win because my daughter loves JoJo! I would like to win as my daughter would love it. My daughter would definitely enjoy this. I'd like to win for my granddaughter she loves this show! I would like to win in order to gift it to my grandchild. 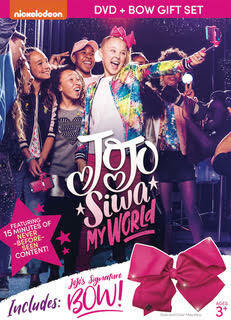 I have grandchildren that definitely would like the JoJo Siwa: My World DVD and Bow Setfor an amazing time.